"A healthful salad with a yummy orange juice tang!" 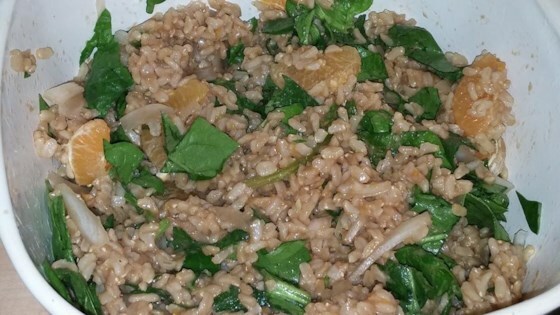 Just before serving stir the spinach leaves, oranges and onion into the rice mixture. Way too much rice for the rest of the ingredients. But rice was good and the left over portion will make another salad. I MADE THIS SALAD FOR A LADIES LUNCHEON AND IT RECIEVED RAVE REVIEWS. I COOKED THE RICE IN SWANSON'S VEGETABLE BROTH AND ADDED DRIED CRANBERRIES FOR COLOR. WOULD MAKE THIS AGAIN IT IS A WINNER. For added zip, to the orange juice mixture, add on clove minced fresh garlic. Works very well. Great 'company' dish on a hot day. Served with BBQ chicken breast it made an awesome meal - highly recommend it!! The rice when cooling absorbs the orange juice and creates a really nice flavor.